GACKT to fulfill his promise at last…? I always knew this day would come. From the bottom of my heart, with the strongest gut instinct, I knew it would come. Through the Japan tours and the European tours and the hints and the teasers and the vague little “maybe”s, I knew he would one day have to cave in and give us what we want. GACKT is coming to North America. Not for movie premiers. Not for holing up in a recording studio. Not for sight-seeing. GACKT is coming to North America for a tour. Funnily enough, I always used to joke that the one day he finally announced a NA tour, it would be at exactly the same time I went back to Japan, and we would pass like ships in the night. Guess where I was supposed to be in March? Lemme write about this when I figure some of these emotions out. ….As a side note, he knows North America is more than just Canada and California, right? Hurry, someone send him a map before they finalize locations..! Thanks to @kimberdesu for the tip. I wish I was announcing 382 tour dates. Almost as good, here are the 14 dates for MIYAVI’s 2011 world tour No. and So. America circuit. A little bummed that he didn’t announce a Boston date, as not only is it my favorite east coast city, but Megabus just started service from my city to Boston… I can tell you one thing, I won’t be getting $1 tickets to NYC any time soon. Big deal. Will def be picking up tickets for the NY show– which will be my first time at Irving Plaza. You ready to get rowdy, New York? I feel as though there’s an unspoken (and sometimes spoken) sentiment among overseas Visualists (particularly No/So Americans) that falls somewhere along the lines of, we’re unnoticed, our fandom unappreciated, our prayers left unanswered. 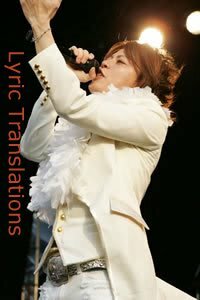 As I recall, a little bitterness flared up summer of last year when GACKT announced his international debut– in Europe. Oh come on, we’re all a little guilty. This is more or less a working hypothesis on my part — based on Twitter conversations, mainly, and fleeting observations; it’s somewhat sad, though. I highly doubt any fans are slighted or left unappreciated; actually I’m sure most bands would be stoked to perform for as many audiences as possible all over the world. Touring overseas is a massive undertaking, requiring visas and money – lots of money, as well as time, energy, and enough of a reception to foot the (considerable) bill. It’s a form of promotion a bit pricier than handing out fliers in Shibuya, I’ll say that much. It’s actually come to my attention the past year or so how much bands are working to overcome this obstacle of time and space. Although I’m sure they understand that nothing, nothing will replace the exhilaration of being crushed up against the stage in a dingy little club, your favorite band inches, feet, yards from you, rocking out before your very eyes. However, there is a way to emulate universal inclusion. Oh the joys of the 21st century. More and more artists and groups are catching on to the phenomenon that is live-streaming. It seems like pretty much anything and everything can, and is, streamed live on the internet. We can now watch real-time interviews, press-conferences, talks, events, and– you guessed it, live concerts. If this isn’t the most legit use of the internet since its advent, then I honestly can’t tell you what is. Although the fact of live-streaming via USTREAM doesn’t rate the front cover of The Your- City-Name Times, the content can still be pretty attention-catching. And this week, the content is certainly worth its weight in bandwidth. As it were, this Sunday will see the conclusion of Jrock megastar duo B’z‘s short North America stint, LIVE-GYM 2011 – long time no see –. The performance, held in Los Angeles at CLUB NOKIA, will be streamed live for free via USTREAM, an answer (compromise) to the prayers of Visualists who don’t count on waking up mysteriously in a hotel in downtown LA on the 24th. The concert will be streamed at 7PM local time (LA) — following is a list of the corresponding times in the major cities. I don’t envy Paris, but it’s well worth it. Access the live-stream here. For smartphone (actual intellectual quality of said devices being a matter of opinion) users, go here. I’ve never pretended to be a huge fan of Dir En Grey. Actually, I’ve never pretended to be a fan at all. “Respect”, is the simplest way to describe my opinion of “Diru“. I respect the band, and I respect its fans, and I respect the fact that they have a lot of good music. But maybe it has something to do with the fact that whenever you’re mid-conversation with a Diru fan and they pause to say, “Oh I loved their one release….uhm…” you can suggest “Uroboros?” and pretty much hit the nail on the head. They don’t even have to whistle the best song for you. Too easy. Or maybe it has something to do with the fact that I don’t want to be vomited on by my favorite band– I don’t think I like any band enough to rinse chunks of their pre-show sushi out of my hair. Dir En Grey will hit up Europe next month with a full European Tour, starting out with a sold-out show at Wacken Open Air, and moving on with their PARADOX OF RETALIATION Tour. North and South Americans, don’t feel excluded yet. The band will hop the holiday train for their recently announced Americas Tour, Age Quod Agis, starting off in Chile on 11/23 and working their way north throughout November and December. Canadian synth-rock group Birthday Massacre will open the show for 11 of the 17 listed dates. Yeah, I’ve never heard of them either. For a full list of dates, venues, and ticketing information, visit the band’s OHP or facebook. As a side note, I remember hearing a lot of moaning (not the pleasant kind) about the band’s look. Honestly, I think they look sweet — I didn’t think I’d ever compliment someone with a buzz-cut, but Kyo’s actually rockin’ it. Although very little information aside from the basic announcement is available, it was confirmed today on MIYAVI’s OHP that he will be doing another World Tour in October/November of this year. At this point, only two dates have been released, but as the summer progresses, more dates have been promised for North and South America. Keep your eye on SG for more information. I have to admit, this week has had the Visual Kei/Jrock industry full of so much “wtf”, it’s a relief to finally have a piece of news I’m not psychologically prodding with a 20-foot pole. MIYAVI’s show in Boston last summer was one of the most memorable and outstanding experiences I have had the pleasure to partake of, and should he hit up the east coast again, I will not hesitate to jump on some tickets. I highly recommend anyone who has, and most especially those who have not yet had the pleasure plan on seeing MIYAVI should the opportunity arise. Last year’s big, exciting Jrock moment, as many of you probably still remember, was the “international”- aka European- debut of GACKT Sanders’ YELLOW FRIED CHICKENz project. The tour, a short, experimental stint with a few scattered dates in a select few countries, sold out in a record 4 minutes of tickets being released. After this information reached the Colonel, he expressed a sense of regret that so many fans had wanted to see him perform, but were unable to because of the limited number of dates, locations, and the haste with which tickets sold. It seems like he was sincere in that regret, as his second round through Europe is much more extensive, and rumor has it, booked in larger venues to accommodate the masses of European fans lining up to show GACKT that, yes, they are fried chickenz. I just hope that he has taken some time to actually rest and prepare himself for this venture…The last thing we (collective worldwide “we”, not Japanese version of ‘worldwide’ “we”) need is a replay of Munich ’10. And there we go, I used my mind-link with higher forces (the same link that was used to troll the living hell out of me back before I conformed to The Perm-loving masses. And there we go. It’s public.) to get a ball rolling with the Visual Kei/Jrock summer news. And, of course, it’s GACKT who steps up to the plate to accept the challenge. Actually I think it, unlike The Perm trolling, was probably a coincidence. Not only will GACKT be releasing a new summer single (7/13, title TBA), but JaME’s official Facebook page published the inciting tip-off that Jrock’s grandmaster will be taking another dip into global relations with a second European tour this summer. I vaguely remember the Internet exploding with stoked-ness last time this happened. For all the people who were able to attend GACKT’s shows in Europe, it was a life-changing event (in some way or another, at least), and for those of us sitting around at home or work depressed, checking their watches, thinking “I suppose GACKT’s on stage right about now…”, it was an iconic moment of blinding hope: GACKT was going international. Legit international. Kind of. Which, for the rest of the world, meant there was hope for us to. As a North American who has yet to invent a teleportation device, I probably won’t be catching a quick flight to Germany this summer either (that thought won’t stop me from starting to play the lottery, though), but I am certainly making a mental note of the year on my calendar, really trusting that we will get our chance too. Although these year-long periods between alleged test-runs feel like eternity to us, actually this whole annual European tour thing is a good sign. If he can continue proving to the Jrock Powers That Be that he can kill an overseas tour again and again, who knows what they’ll let him do? I mean, with YOSHIKI becoming self-proclaimed Emperor Hollywood, he might even let GACKT open one of his creepy theme parks in California. And damnit, if not, to hell with it– I’m heading East.